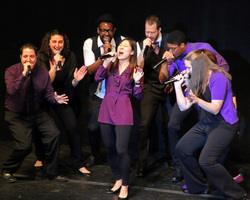 4GotteN SuitCase is Ramapo College's premier co-ed a cappella group. Founded in 2011, 4GotteN SuitCase has since then expanded in repertoire, group size, and performance experience. 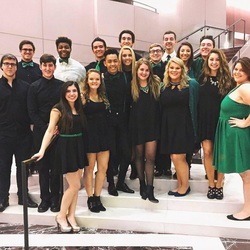 They have connected with many local collegiate a cappella groups in New Jersey and have performed throughout the New Jersey/New York area including the Maplewood First Night New Year Event for the past two years, and the ICCAs for the past three. From birthday parties to flash mob weddings, this a cappella group enjoys sharing their love of music to all those who will listen. This is SuitCase's first year competing in the Aca-Idol competition, and they can't wait to meet and sing alongside the other groups in attendance! Famous Janes is a new Female A Capella Quartet that epitomizes the best of Barbershop, while specializing in performing songs of the heart. 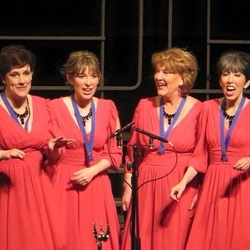 Famous Janes was proud to compete at Sweet Adelines International Competition and is already qualified for this year's International Competition after being together for only a few short months. The Janes are the current Region 19 Sweet Adelines International Regional Champions and Top 15 in the world. This is just the beginning for Famous Janes as their journey together as a foursome has just begun. King's Post is a vocal ensemble from Blacksburg, Virginia with a bent towards Pop and Pop Culture. Aiming for the familiar and recognizable, they will co-op almost any style to bring a smile to the audience. Influences on the group reach back to satirists of the mid 20th century, rock legends, theatrical composers, and anything with modern geek cred. Maverick Elision from Minnesota State University, Mankato has a long history of prominent performances in the Midwest and on International tours. 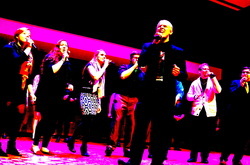 The group has evolved from a show choir (in the 70s) to vocal jazz, to contemporary a cappella. Former members have gone on to careers in film, television, theatre, music, and in the world of a cappella, in the NBC SingOff winning group, Home Free. The Ohio State of Mind is a co-ed group from The Ohio State University. Comprised of 18 members, they arrange and perform a blend of pop, jazz, and indie music. OSM has the honor of performing at both university and private events in the Columbus area and beyond and have even been featured on HLN's Weekend Express. This group has traveled to SingStrong Chicago for the past two years and is excited to experience the event in a new city! This close-knit group is passionate about board games, nicknaming each other, spinach dip, and of course, a cappella! The Notochords are an eclectic ensemble from Virginia Commonwealth University (VCU) down in Richmond, Virginia. They were founded before most of the current members were even born- back in 1992 on VCU's Medical Campus. The Notochords regularly perform at campus and community events. They have also competed in several collegiate invitationals. Most recently, they performed at Kings Dominion's 2016 Opening Day Ceremony. As one might think, they lost their voices from too much screaming on rides, but luckily they have recovered. They are so excited to be competing for their third time in ACA-Idol! R.A.M.ifications (RAM) is the most recent addition to the a cappella community at Virginia Commonwealth University in Richmond, Virginia. Established in 2009, the group consists of 18 singers. During their first semester, RAM performed at STRUT, VCU's premier fashion show, and sang the National Anthem at an athletic event at the Greater Richmond Convention center. 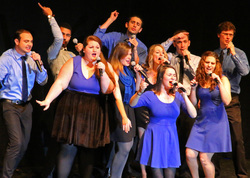 Since then, RAM has hosted several collegiate a cappella invitationals and has competed in the SingStrong ACA-IDOL Competition for several years in a row. Their goal this year: take home first place! 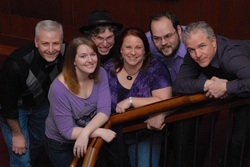 Vox Pop is a vocal band from the Washington, DC area and a proud member of CAL. Since 2001, the group has earned a reputation as being one of the most entertaining local groups of their kind. Vox Pop has been featured as headline performers at such venues as The Music Center at Strathmore, Maryland Hall for the Creative Arts, and World Cafe Live at Queen (Wilmington, DE). 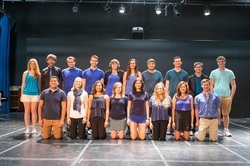 In 2015, the group competed against some of the top vocal groups in the area and took home First Place at the ACA Challenge competition at the Lincoln Theatre in DC. The group performs regularly at street festivals, annual public holiday events, and is available for private bookings. Vox Pop boasts 2014 and 2016 CARA nominations for Best CAL Album, Best CAL Song, and Best Non-Scholastic Arrangement. Word of Mouth, winner of DC’s first “Aca-Challenge” a cappella competition, is a mixed all-vocal band with a serious passion for contemporary a cappella and a Peter Pan complex. Formed in November 2011 through CASA, Craigslist, and you guessed it – word of mouth – its inaugural members are plucked from some of the East Coast’s premier collegiate singing groups and just can’t seem to kick the habit. Brought together by a love of all-vocal performance, Word of Mouth hopes to elevate a cappella to the next level with edgy takes on fan favorites and pop music of today. AND CHECK OUT SINGSTRONG'S HEADLINE PERFORMERS!